This time of year many garden centers, holiday markets, and even your local grocery chains have the blissful, fragrant delight of the Paperwhite bulbs. When I see them, I’m intoxicated with delight. 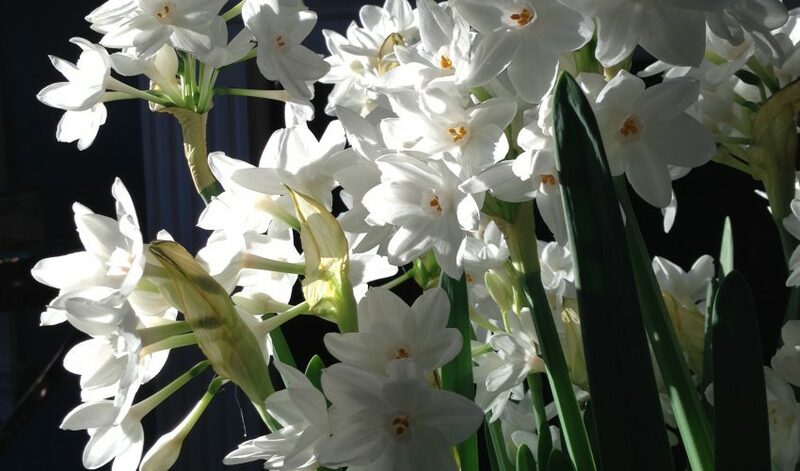 Narcissus Paperwhites are highly fragrant, and because they are so easy to force bloom when indoors, they are very common during the holidays. Their sweet scent, pretty flower shape, and tall stalks make them excellent reminders of the spring that is just beyond the horizon. Paperwhites require no preparation and are absolutely foolproof. In fact, they don’t require special conditions (like a specific temperature.) Simply keep in a bright, sunny spot, and water well every couple of days. For longer-lasting blooms, move the bulbs to a cool spot out of direct sunlight once flowers appear. So how do you get Paperwhites to be on display when you are entertaining? Or to be in bloom when you gift them? Here’s how. They don’t bloom until 4-6 weeks after they are planted indoors — so if you want them to be showing during a party or when you give them as a gift, buy them mid-late November if you can. If you get them now, they will be starting to bloom in time for New Year’s Eve. Worried you can’t time it that well — let’s say next for year? Bulbs may be held for weeks in a warm, dark closet, which allows plenty of flexibility in orchestrating displays for holidays or other special occasions. After Paperwhites finish blooming, don’t worry about trying to coax a bloom again next year. They won’t bloom again indoors. As they are so readily available, I don’t even bother storing them to plant outside in the garden next fall — I let my spent bulbs do their good in my compost pile. So this winter, invite Mother Nature in with a collection of Paperwhites. You’ll leave Old Man Winter out in the cold to weather the season alone with Jack Frost.